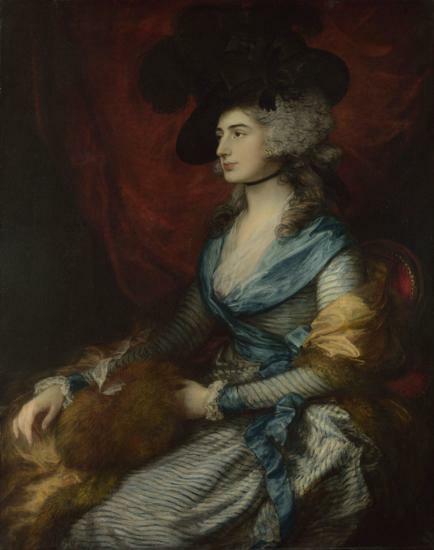 Thomas Gainsborough, Mrs Siddons, 1785. Oil on canvas, 126 x 99. 5cm. National Gallery, London. Currently on display at Gainsborough and the Theatre, Holburne Museum, Bath. Susan Sloman, Gainsborough and the Theatre (London: Philip Wilson Publishers, 2018), 1. Exhibition Catalogue. Gainsborough and the Theatre is a temporary exhibition at the Holburne Museum in Bath, and explores connections between the painter Thomas Gainsborough (1727-1788) and the eighteenth-century theatre. The exhibition puts the city of Bath, home to the painter for much of his life, on the map, both in terms of its historical connections to the world of Georgian theatre and as a venue for important contemporary exhibitions such as this. Certainly, the show is not provincial in its sights or ambitions. As Chris Stephens, Director of the Holburne, states in his foreword to the exhibition catalogue, both the exhibition and book “neatly encapsulate the rich inter-connections both within eighteenth-century Bath and between the small, fashionable spa town and the capital.” Published in accompaniment to the exhibition, the catalogue stands as an important work in its own right and will, no doubt, be useful for both theatre and art historians. It is authored by Susan Sloman, who has published widely on Gainsborough, and Hugh Belsey, whose catalogue raisonné of Gainsborough’s portraits will be published by Yale University Press in late 2018. Gainsborough and the Theatre takes up themes of celebrity, performance, friendship, and the development of naturalism in both theatre and art practice in the mid-to-late eighteenth century. It is laid out across the Holburne’s large second-floor gallery, and contains prints, and material culture alongside Gainsborough’s striking portraits. While the display text is relatively low-key throughout, it succeeds in providing thought-provoking and insightful content alongside the works and objects on display, leading visitors to pose important questions about Gainsborough’s life, his artistic process, and his professional and personal relationships within the theatrical circles of the period. The exhibition is organised by theatre, with each section of the display laying out Gainsborough’s connections to the actors, playwrights and managers who populated them. First is Bath’s Orchard Street Theatre (later the Theatre Royal after it was granted a royal patent from George III in 1768.) The royal patent greets visitors stepping through the doors into the exhibition space, along with a surviving playbill from 1781 detailing a performance of Shakespeare’s The Merchant of Venice in which Sarah Siddons played Portia. Visitors are next transported to the Theatre Royal in Drury Lane, where David Garrick worked as the theatre director and leading actor, followed by the King’s Theatre (famous for its operas) and the Little Theatre (both in the Haymarket), and finally to Covent Garden Theatre. Susan Sloman, Gainsborough and the Theatre, 2. The show brings together works from the Holburne’s own collections with those from the V&A, the National Gallery and various private collections. The hang, with its careful positioning of the paintings at eye-level, allows visitors an astonishing level of intimacy with Gainsborough’s portraits. Moving around the space, one can make out the painter’s lavish, confident strokes and his tendency to load his brush with thick paint before applying it with a characteristic combination of flamboyancy and control. Standing in front of each work, visitors are invited to look directly into the eyes of the people Gainsborough immortalised on canvas – from the humorous face of David Garrick to the tragic gaze and heavy brow of the ill-fated Richard Tickell, we are introduced to a whole cast of characters that come alive under the artist’s direction. Parallels between painting and performance are drawn out here. Central to the exhibition is the evolution of naturalism in both disciplines during the eighteenth century. Importantly, Gainsborough is positioned as a leader at the forefront of the movement, whose art both practised and bore witness to these changes. While thoughtfully-positioned portraits allow visitors to step inside the intimate and exclusive world Gainsborough sought to capture, important accompanying letters, prints, and material culture expand our perception of this world to reveal networks between patron and client, between performers and writers, artists and singers. Among the artefacts displayed is a satirical handkerchief, printed on linen as a souvenir commemorating Garrick’s 1769 Shakespeare Jubilee in Stratford. More privately, a letter written by Gainsborough to David Garrick exposes something of the painter’s personal investments in theatre circles, giving visitors a glimpse of his voice alongside his painted works. 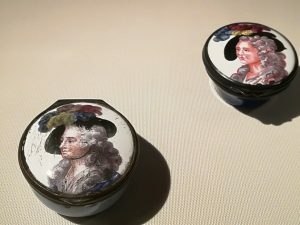 Two patch boxes decorated with portraits of Mrs Siddons, after 1785. Enamel. On loan from Gainsborough’s House, Sudbury, Suffolk. Photograph author’s own. Gainsborough’s power to create the public image of those who traversed the boards is evident throughout. The treatment of his 1785 portrait of Sarah Siddons, on loan from the National Gallery and displayed alongside material culture objects that imitate and adapt the painter’s original image, is especially effective. Two small patch boxes borrow Gainsborough’s portrayal of the actress, emphasising the potential of his work to create recognisable images of performers as well as its adaptability in the hands of both makers and consumers of material and visual products. The final triumph of this exhibition is the extraordinary attention paid by its curators to Gainsborough’s fascination with the ephemeral, a symptom of his growing interest in the new naturalism entering the performative arts. Throughout the exhibition, dance, song, and theatrical performances are all represented in Gainsborough’s art, while works by others including Giovanni Battista Cipriani and Thomas Rowlandson conjure broader views of the eighteenth-century theatrical worlds glimpsed in his portraits. Susan Sloman, Gainsborough and the Theatre, 1. For Gainsborough, props served not only as identifiers of individual characteristics or professions, but also as instances of artistic and ephemeral animation, revealing Gainsborough’s interest in capturing the three-dimensional on a flat canvas, and representing the performative and fleeting, the intellectual and the creative as manifest in material objects. This important exhibition will be of interest to scholars and members of the public alike. For theatre historians, it offers exciting perspectives on the social and professional intersections between the world of fine art and performance. Likewise, for art historians, Gainsborough and the Theatre succeeds in posing timely questions about the boundaries between art history and material culture studies, revealing the many ways in which eighteenth-century fine art corresponded with luxury goods that could disseminate image and enhance celebrity, establish and confirm social networks, and capture creative talent. Gainsborough and the Theatre is on at the Holburne in Bath until 20 January 2019. Tickets are £12.50/£7 (includes donation).